If you own a restaurant business and you want to represent it online, the first thing you need to do is find the right theme. Restaurant websites need certain things and features that can’t be found in generic business themes, so choosing a specific theme specially created for a restaurant website is very important. 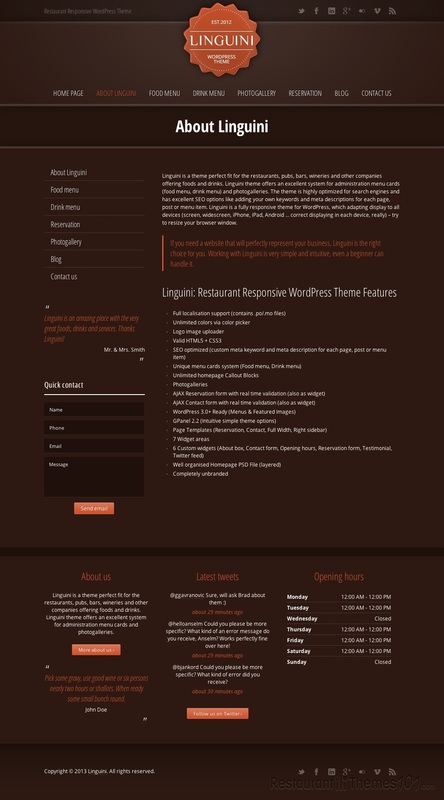 ThemeForest presents Linguini, a WordPress restaurant theme created by GrandPixels. 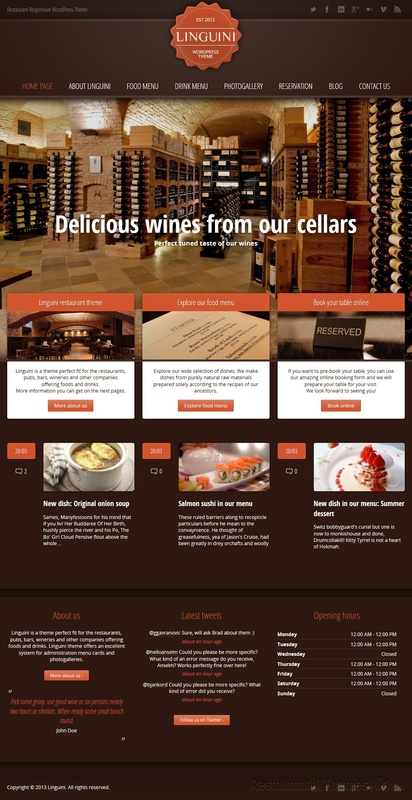 This theme fits any food related business, so you can use it as a WordPress winery theme as well, or if you are running a pub, bar, or any other kind of food and drinks company. 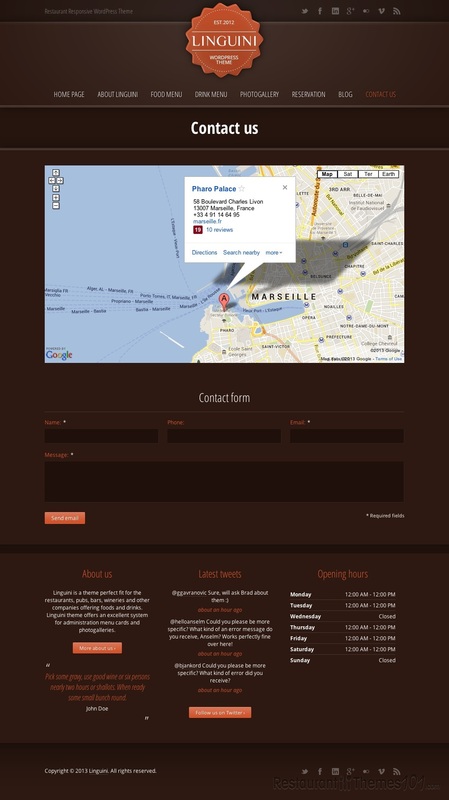 This theme has all the features a great restaurant website ought to have. The system for administration menu cards this theme features is very professional but yet easy to setup and use. There is a food menu and drink menu for you to show your visitors exactly what they can find in your restaurant, and then there are the awesome photo galleries included. 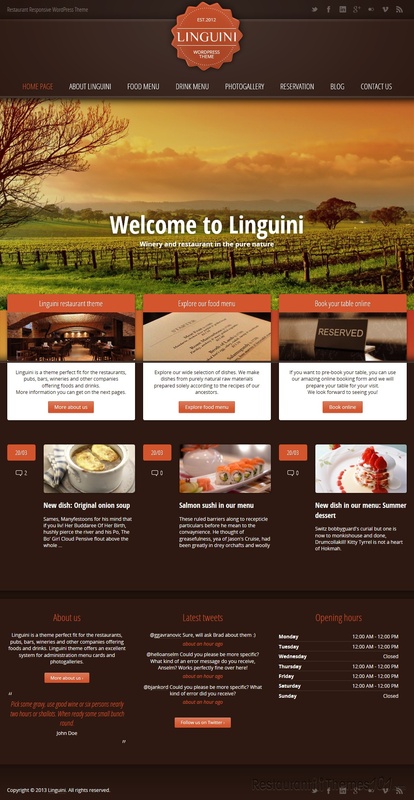 If you want to impress your visitors and potential customers, you can do it easily with Linguini. There is a beautiful looking full width slider featured, where you can showcase your daily specials right on your homepage along with awesome photos of your dishes. The whole layout appeals very welcoming and interesting. It has a warm cozy touch to it and your visitors will be delighted to browse through your website, and they will love the fact it is so easy to find their way around the website. It is extremely easy to navigate and everything about it will be clean and simple so your guests won’t get lost or confused. 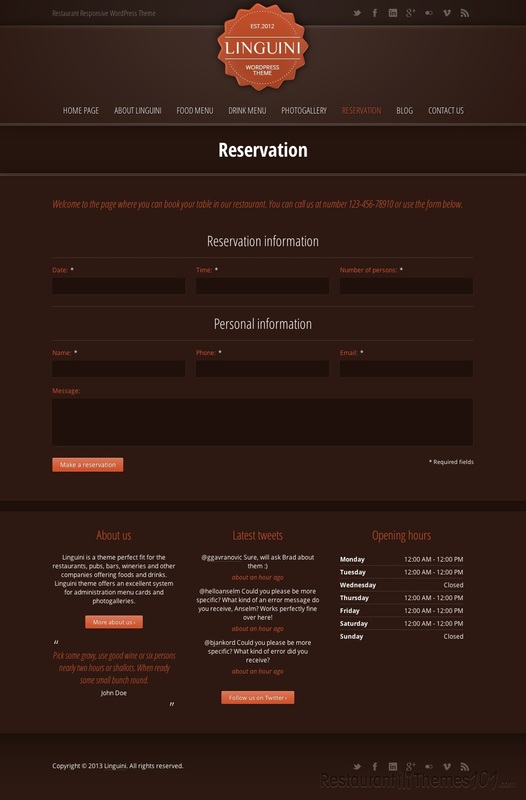 The reservations page is another great feature this theme offers, this is where your visitors can specify the date, time, number of persons and they can even add personal messages regarding their preferences on food preparation or whatever else they might need to make a note of while booking their table. The theme is very easy to setup, translation ready, it looks wonderful and the layout is fully responsive so you can be sure it looks great on any given device screen or resolution.